Christmas is here! Maybe the most celebrated holiday of the year in Greece, it cannot get more festive. Athens and the rest of Greece is decorated with lights, Christmas carols and “Wham” songs are everywhere lifting spirits. Traditionally families and friends get together to celebrate the Christmas period, which lasts for 12 days. It begins on the 25th of December and lasts until the 6th of January, the Feast of Epiphany. Obviously in a country that takes pride in its tradition of food and there is no better time for a “tour de gastronomie”. 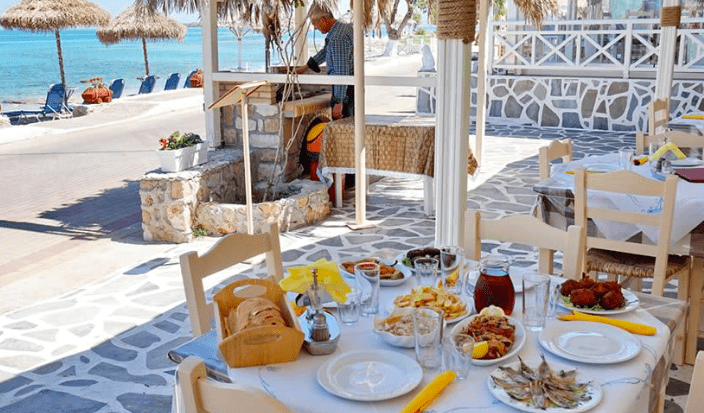 So many delicacies from all over Greece, cooked in various ways depending on the region. It was a challenge narrowing them down, to choose the most popular and available but here it goes! These oval shaped desserts, made with flour, olive oil and honey, are the signal of the festive season. When you see them in pastry shops or bakeries, you know that Christmas is here! THE most beloved traditional Greek dessert, produces only during this season could easily be the theme of a Christmas song! These shortbread cookies can also be described as the embodiment of the festive season. 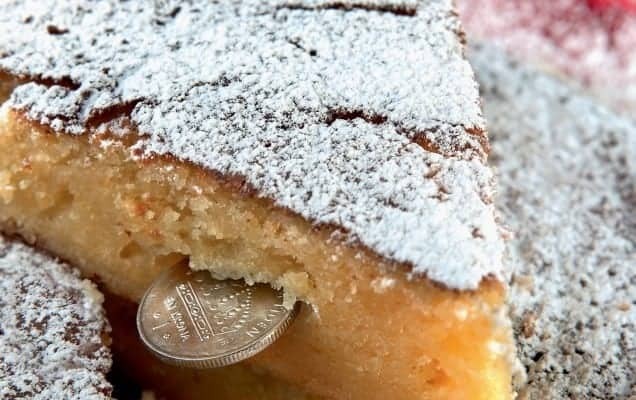 They are made with almonds or other nuts and dusted with icing sugar. 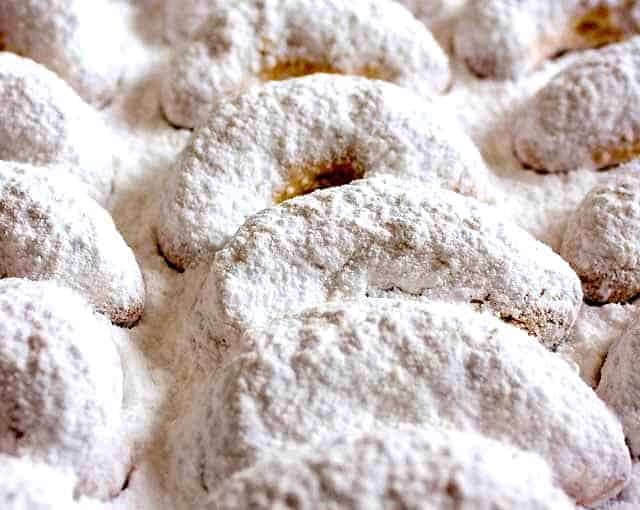 This white tasty ‘dust’ can also betray when someone has eaten a kourabie, as it leaves signs! 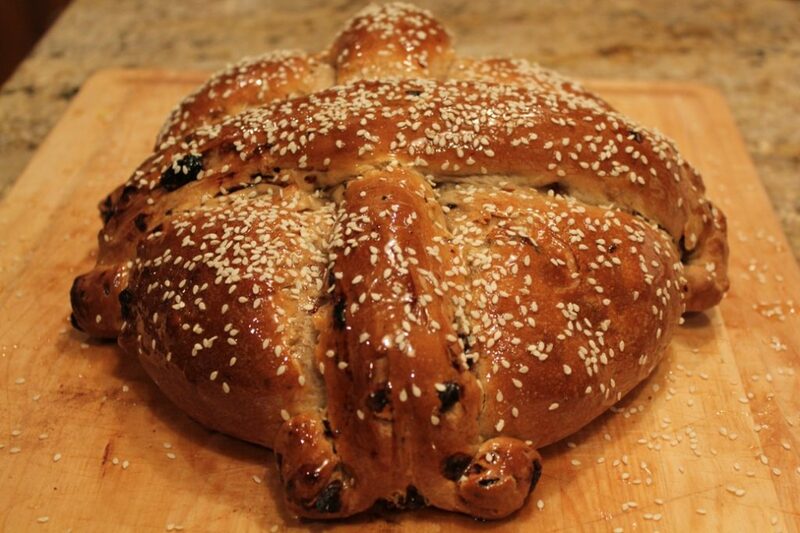 This loaf of bread is usually decorated with the letter “X” in the middle, which is the first letter of the word ‘Christ’ in Greek. People make it on Christmas Eve and eat it the next day, the day of Christmas and it’s always made with the purest and finest ingredients. 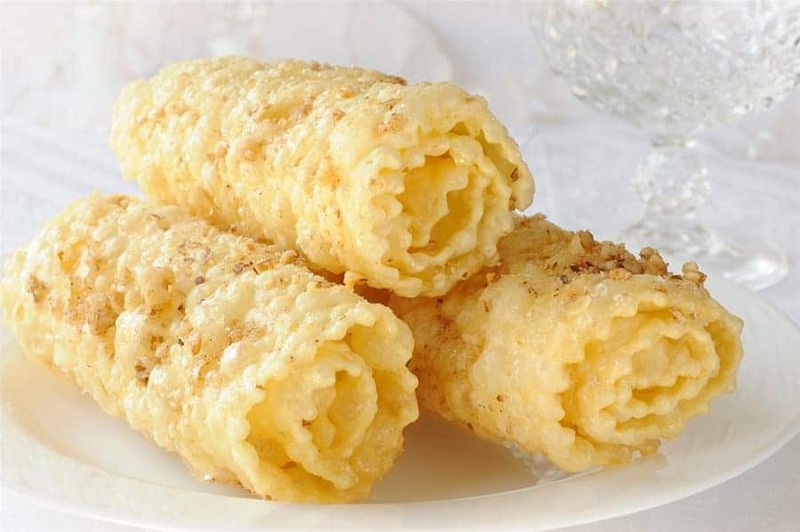 A very common dessert in the Peloponnese region and very popular in general during Christmas. ‘Diples’ means ‘folded’ and it’s also called “the pancake of the poor” it is lightly fried flour and drizzled with honey and walnuts. A special pie that can be made in various ways. Imagination is free here! The common things is that it hides a lucky coin inside and whoever gets it in their piece is expected to have luck throughout the year. The traditional meat of the festive season, which can be tasted in various ways depending on the region and the city. In Crete, for example, people make it with lemon leaves. 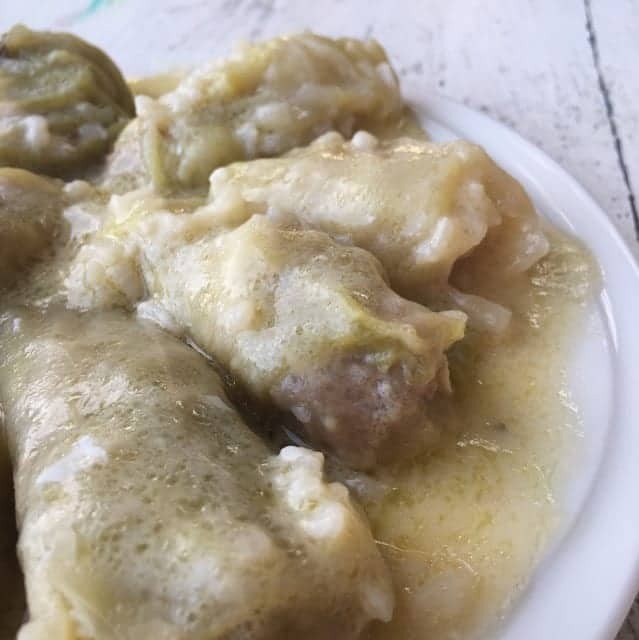 In northern Greece, people use to eat “msoura”, a dish made by pork, beef and chicken, slowly cooked with rice and vegetables in the oven. This is a kind of new tradition in Greece and shows influence by western cultures. Many houses prepare a turkey, stuffed with rice and nuts, for the family dinner. Chicken is also a very popular dish during the last years. At Trikala, they make chicken stuffed with rice and raisins. 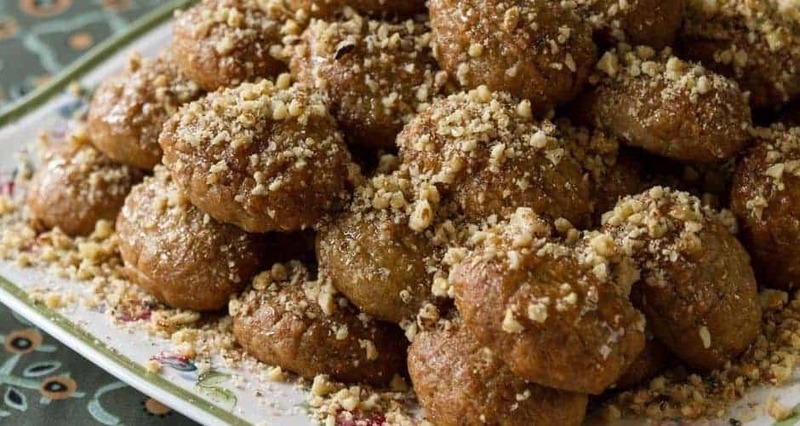 Although it’s not a strictly Christmas dessert, is one of the most loved in Greece and there is no chance to visit a house and not find a galaktoboureko treat. Amazingly delicious custard pie with cream and phyllo dough. All kinds of pies can be tasted during Christmas in all parts of Greece. In Ipiros, for instance, they make meat pie, sweet pumpkin pie or milk pie. 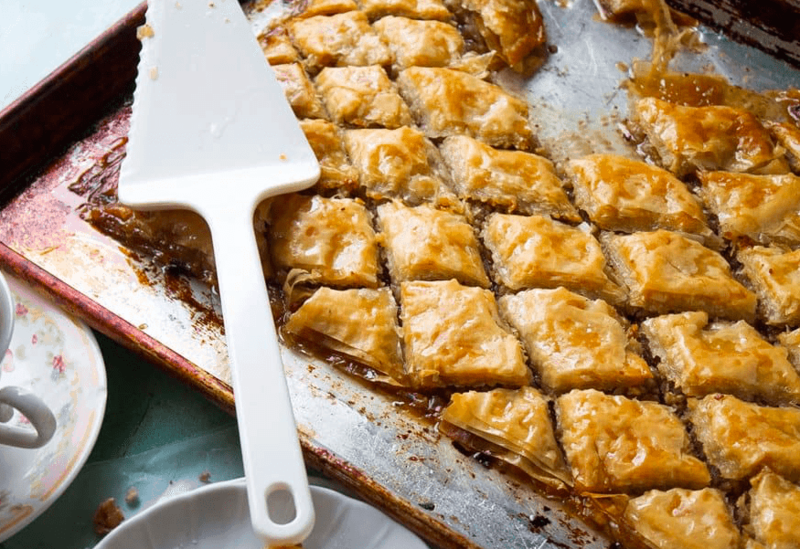 Lastly, almost every house in Greece has baklava to offer to guests, although it’s not a strictly Christmassy dessert. 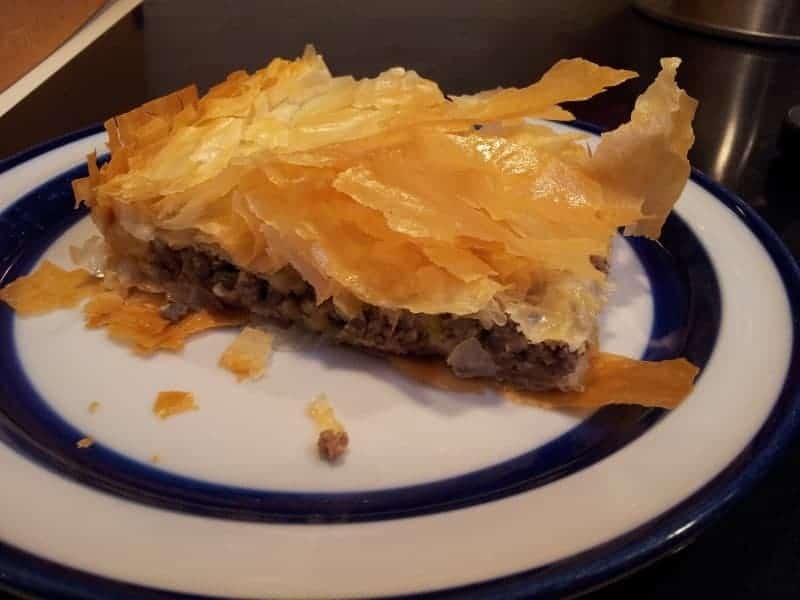 Baklava is a pastry made of layers of phyllo filled with nuts and held together with honey and is always good news for coffee lovers! The festive season of Christmas is here. It’s this time of the year that people get together, celebrate the birth of Christ and reunite with homemade food and wine. 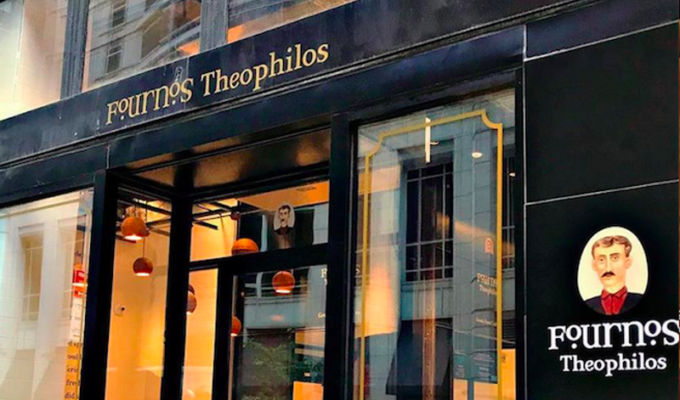 Every part of Greece has its own special and rich traditions and is definitely worth experiencing. Whatever you do and wherever you go, enjoy! Merry Christmas!